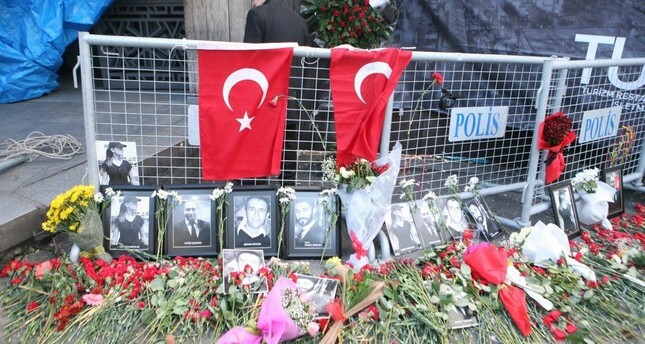 Flowers, Turkish flags and photos of victims on and around police barriers outside the Reina nightclub. The second hearing in the trial of Abdulgadir Masharipov, a gunman for the terrorist group Daesh, who killed 39 people in Reina, an Istanbul nightclub during New Year celebrations last year, was held yesterday. The court rejected the jailed gunman's request not to attend the hearing, while survivors of his massacre recounted the horrible moments of the slayings and how they managed to dodge random shots purely by chance. Uzbek-born Masharipov is among 57 defendants in the case. As revelers were welcoming New Year at the popular club on the shores of the Bosporus, he entered the venue, wielding a AK-47 rifle. After mowing down his victims, he fled the scene and was captured a few weeks later in a safe house in Istanbul's Esenyurt district. His lawyer told the court Masharipov was reluctant to attend the hearing, fearing the "insults and threats" of plaintiffs, but the judge ordered him to appear. As Tene Traore, Masharipov's spouse, who attended the hearing via video link from the prison where she is held, attempted to show Masharipov his 6-month-old boy, the mother of one of the slain victims shouted, "Who will show me my son now?" Burcu Sarıca, a survivor, said she heard "noise resembling gunshots" after midnight and "chaos ensued." She said she and some 20 other people ran outdoors of the club. "I was in a place with glass walls, far from (the gunman's view) and close to stairs to the exit. I wasn't shot, but I want him and others to be punished with the heaviest sentence for every life taken there," she told the court. Günel Hüseynova, an injured survivor, said she first thought there was a brawl and saw people "backing" towards the spot she was at. "Then, my friend told me to get under a table. Just as I was crouching down, I was shot in the arm. I stayed under the table for about seven minutes. It was like hell. I heard (Masharipov) shouting 'Allahu Akbar (God is great)' and firing again and again. I saw another person hit in the chest and he died there," Hüseynova recounted. Duygu Karabulut was entering the club when Masharipov stormed in. "He started running towards us. I started running too. He ran past my right side. He wasn't turning around. If he turned left, he would see me and perhaps fire on me," she said. Karabulut fled into the club's lavatory where she and others hid until the massacre ended. Karabulut said she only saw the gunman as "a shadow," but she was sure it was "that disgusting man" she saw in court. "May Allah curse him," she added in anger. Prosecutors asked the court to sentence Masharipov to 40 separate aggravated life imprisonments and an additional 2,397 years for the killings and other crimes. More than 120 people, including the nightclub's operator, are among the plaintiffs in the case; most are the families of foreigners. Reina was full of revelers from the Middle East and Western countries when Masharipov, who arrived by taxi, made his way into the club after killing security guards outside. The suspect then took advantage of the commotion in the aftermath of the attack and fled the scene posing as an injured man. Prosecutors say the Reina attack was carried out on the orders of Islam Atabiev, also known as Abu Jihad, a Russian Daesh militant in Syria. Atabiev, who also runs Daesh's media outlets in Russian, dispatched a militant to Turkey to instruct Masharipov about the attacks. This unidentified militant gave an audio recording of Atabiev ordering the attack and some cash to Masharipov a week before the attack. In the audio recording, Abu Jihad says, "Istanbul should not be safe for infidels." Daesh, which emerged in neighboring Iraq and Syria, exploiting the lack of security and civil war, was quick to turn its sights on Turkey, which it declared among hostile states. After a 2015 bombing in Şanlıurfa, a city near the Syrian border, it launched a string of attacks in big cities including the capital Ankara and Istanbul, the country's most populated city. The Reina attack followed suicide bombings and a shooting by Daesh militants at the city's Atatürk Airport in 2016 that killed 45 people.